Well there's definitely an autumn nip in the air and sadly our swallows have gathered and departed South. I'm always reluctant to see them go. We can't complain though, we've had a good end to summer and the stock are thankfully still outside with plenty of grass to go at. We have a house cow! A dairy friend of ours had a slow milker, so we bought her from him for Dave our bottled calf. I've called her Sarah, after the farmer's wife. The calf is a Dairy Shorthorn, used to being shown so halter broken and quiet. She's settled in well, saving us time and powdered milk already. I was at our local mart last night for the Alston Moor pre-sale show of Mule gimmer lambs. Lazonby mart is a lovely spot and the ring was busy with people watching the ring and putting their stock judging skills to the test. Well done to the winner, J. Lee, Morley Hill, Whitfield, his best pen made £220 and sold to Julie Brough who was one of the judges. It'll be a busy day today as there's more than 20,000 lambs going through the ring and, as I write, this trade is looking really strong. New records continue to be set in the pedigree sheep rings. Over the last week we have seen a new Blue Texel record of 18,000gns for a ram lamb, a Hampshire Down female record of 2,000gns and a centre record for a North Country Cheviot Hill ram of £8,000 at Lockerbie. Another sign autumn is here is that the suckled calf and store cattle sales are well under way and reporting strong trade for the best quality stock. Friday, September 30th – 4,500 Romney breeding sheep for sale at Ashford market, Kent. 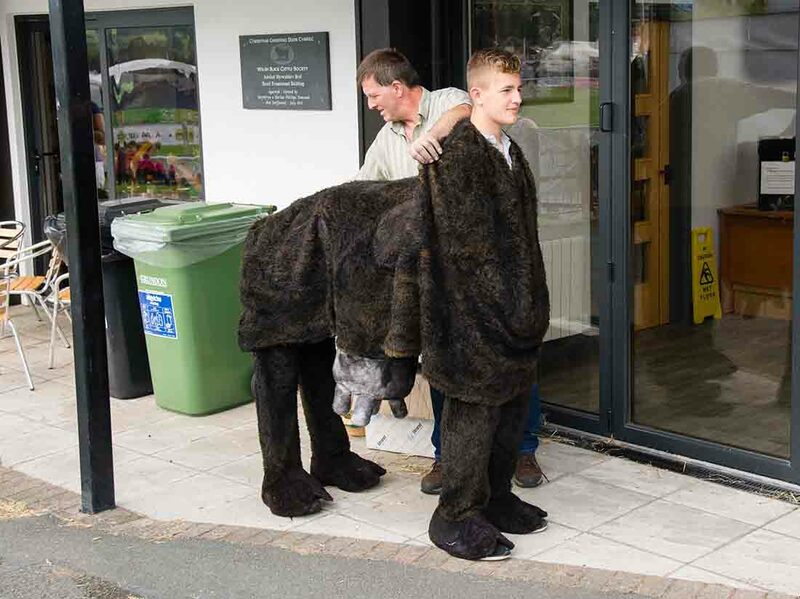 Saturday October 1st – Annual ‘Keswick’ show and sale of Herwick rams at Cockermouth. Monday October 3rd – Great Annual show and sale of 5,000 Swaledale ewes and gimmer shearlings at Skipton Auction mart. Tuesday October 4th – A Mart's the Heart-supported suckled calf show and sale at Wooler mart. Don't forget entries close for the Marts the Heart awards this Friday. We've had over 8,400 votes so far which is pretty amazing. Dairy Day in Telford last week was a really strong event which was well supported. There was a super show of cattle and with the recent milk price increases it felt like there was more optimism about. The Suffolk ewes were scanned recently with an average take. We were really pleased we scanned five recipients that had had single embryos implanted and surprisingly six lambs scanned, unusually one of the embryos must have split, what good luck! The NSA ram sale at Builth Wells saw a new record price for the event of 18,000gns for a Texel shearling. There were a few other big prices but more importantly for vendors averages were up in most breeds, no doubt underpinned by demand from commercial buyers. Likewise, breeding ewes and gimmer lambs seem to be a good if not spectacular trade underpinned by the good prime lamb trade. Monday, September 26th –Hawes Auction Mart hosts a sale of 12,000 Mule and continental cross gimmer lambs and shearlings. Don't forget this next week is the last chance to vote for your favorite mart cafe or auctioneer for the Mart's the Heart awards. Piglets galore! Our two Gloucester Old Spot sows both pigged at exactly the same time, meaning we now have 23 Gloucester Old Spot x Pietrain piglets about the place. On top of that, a bantam turned up with 14 chicks. The breeding sales are coming through thick and fast, with the clearance rate up and also the average up by more than £75 at Kelso ram sales. Over 24,000 Mules gimmer lambs went under the hammer at Hawes, topping at a massive £620 a head and averaging more than £99 overall. In general the gimmer lamb averages seem to be a little bit up on the year everywhere as optimism in the sheep trade continues. Friday, September 16 – Brightwells is holding an official Beulah Speckled Face sheep sale at Builth Wells. Saturday, September 17 – 1,000+ Cheviot and Welsh Hill ewes for sale at Sennybridge Market. Saturday, September 17 – 21st annual show and sale on behalf of the Derbyshire Texel Club at Bakewell Market. Tuesday, September 20 – 4,000 ewe lambs for sale at Hereford Market. Well we're enjoying the last of the summer, although we are locking up the poultry earlier as the nights draw in. We’ve started to crack on with washing the tups to get them ready for sales over the next few weeks. The clipping of the Suffolk ewe lambs was squeezed in too this week, so hopefully the weather will continue to be good so it’s not too big a shock for them losing their jackets! Strong commercial demand seems to be driving the pedigree sheep trade, with some good prices for Texels and Beltex over this last week and averages up on the year at most sales. Likewise, store lambs seem to be a flying trade on the back of a good finished lamb trade, which has seen a bit of a rise at the beginning of the week after last week's slight dip. Sheep sales are in full swing now with the Mule gimmer lamb and shearling sales getting underway, so look out for the latest reports in Farmers Guardian. Friday, September 9 - Mart's the Heart-supported Welsh Mule sale of 3,600 ewes and 8,000 ewe lambs at Builth Wells. Friday, September 9 - Kelso ram sales at Springwood Park, Kelso. Saturday, September 10 - On-farm dispersal sale of tractors, farm implements, drainage equipment and workshop sundries. Held at Mason Fold Farm, Lea Lane, Lea Town, Preston, PR4 0RN. Monday, September 12, and Tuesday, September 13 - Mart's the Heart-supported great annual two-day show and sale of 28,000 Mule gimmer lambs at Hawes Auction Mart. Maybe see you at Westmorland Show. Entries for this month’s competition must be completed by September 6, 2016, and the editor’s decision is final. We want to hear about anything you're doing from everyday farm work, to farm walks, meetings, trips, social gatherings, YFC meetings, even ending at the pub if you like! The weather was hot, hot, hot for most over the Bank Holiday weekend, enabling everyone to get caught up and crops gathered in. I attended Paul Slater’s production sale at Kendal on Monday and what cracking commercial trade there was. Plenty of folk buying. The sale topped at 3,000gns for a pure Texel ram with a fair few Texel, Charollais and Beltex cross rams exceeding the 800gns mark. Averages were up across the board at the national Texel sales, with a top price of 70,000gns for a ram lamb at Lanark and a new gimmer record of 16,000gns set at Worcester. The ewe lamb sales are coming up thick and fast, and with stores continuing to show a healthy increase and fatstock a lot better than it was last year, things are looking fairly positive all round on the livestock side. Friday, September 2 - Second summer sheep fair at Thame Auction Mart. Saturday, September 2 - North of England Mule Sheep Association sale of 3,000 sheep at Hexham Mart. Saturday, September 3 - Halls hosts the 37th annual Texel sale on behalf of the Shropshire and Borders Texel Club at Shrewsbury Livestock Market. Monday, September 5 - Mart’s the Heart is supporting Cheffins celebrating 20 years of machinery sales at Sutton Sale Ground. 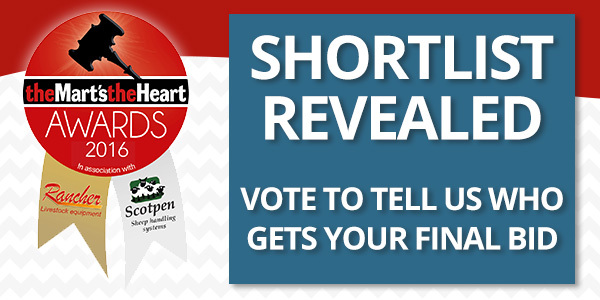 Entries have been coming in thick and fast for this year's Mart's the Heart Awards. If you didn't get involved last year, the awards highlight the vital role auctioneers play within the livestock industry. We're now at the finalists stage, so this is your opportunity to ensure your favourite or local auctioneer wins. To get involved, simply click on the link below.